For the dinosaur race I adopted the Alternate Dinosaur Racing Rules from Sean McGovern’s “Tomb of Annihilation Companion.” He had a brilliant idea to break up the race into multiple stages as racers went around the city. Each stage consisted of an event that racers had to respond to in the form of a skill check, usually Animal Handling. Succeeding added to their ‘speed tally’ on the Initiative tracker. The racer with the biggest number at the end of the final stage was the winner. I liked this idea a lot, though I ended up changing most if not all of the individual stage components, creating my own racetrack around the city. Anyone participating in the race had to register for a 10gp fee, which provided a saddle and someone to evaluate their dinosaur for betting odds. As I suspected, my players attempted to manipulate the system. Therin could wild shape into a hadrosaurus (“Pinecone”) and acted sickly and lame during the inspection (same with his ‘rider’ Mannix), resulting in the biggest long-shot at 6-1 odds. Khaless also registered with her purchased hadrosaurus, Princess Consuela Banana Hammock, and received 2-1 odds. 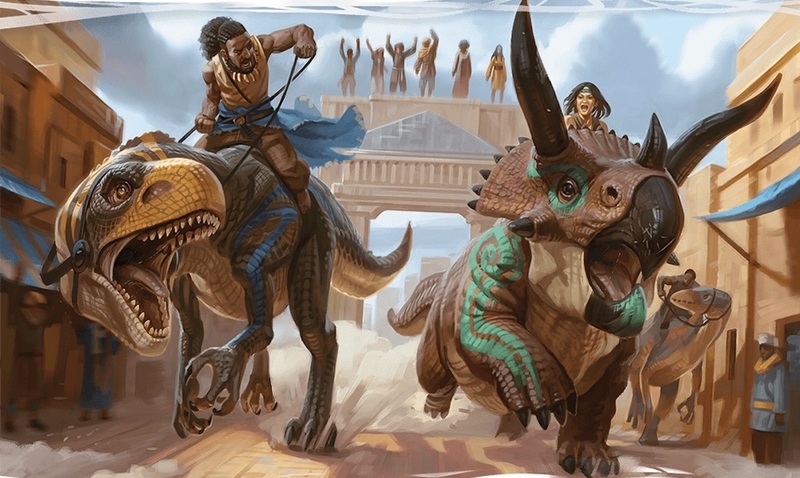 I included four NPC racers: Tiryk, famous racer and son of a Merchant Prince, riding an allosaurus named Bonecruncher; Taban, brutish champion of the arena riding a young T-Rex named Scarback, Kwilgok, a tortle riding an ankylosaurus named Deadly Treasure, and Gondolo, the halfling member of the dubious guides the PCs met at the inn, riding triceratops Zongo. 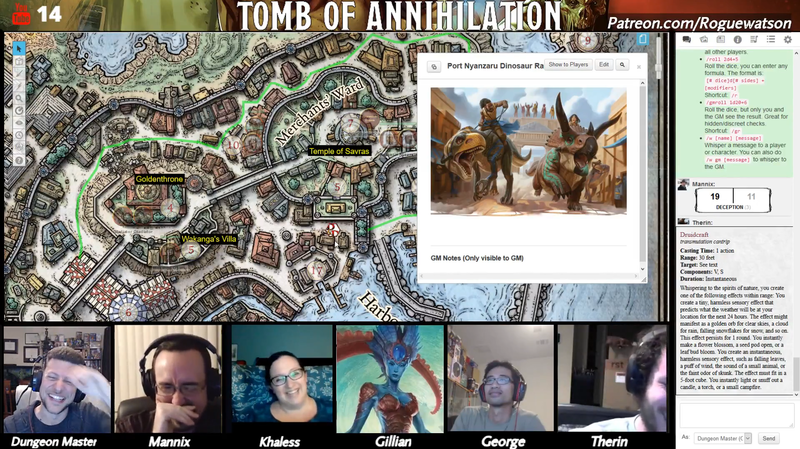 Three of them were drawn from the Tomb of Annihilation book, while Kwilgok is one of the NPC tortles introduced in “The Tortle Package.” All had different dinosaurs, and thus different DCs for their Animal Handling and different speeds for when they succeeded. Admittedly it was a bit tricky to keep up with the various numbers and modifiers without slowing things down too much for the players, which is why I kept the number of racers relatively low. Big enough to be exciting but low enough to keep things moving. My players ended up betting big on their wildshaped druid, thinking they had a big advantage on other racers. The wrinkle they would soon discover was their wild shaped druid had to roll Athletics, instead of the jockey rolling Animal Handling. Therin’s hadrosaurus shape had only a +2 modifier. Here were the total stats for each racer, including the dinosaur’s listed speed, the DC the racer has to meet to successfully move that round, the racer’s Animal Handling modifier, and their odds to win. As you can see, some of the dinosaurs are definitely faster than others, but the DC to control them is also more difficult. As luck would have it, the favorite of the match, Tiryk, performed absolutely horribly the whole way despite his +5 modifier. I rolled 15 after 15, narrowly missing his huge 60 speed boost, resulting in a last place finish. The other racers kept it pretty close throughout, though Mannix/Therin had a particularly slow start in the beginning, with Therin rolling >10 on every roll. They did have one big advantage – Mannix could take the Help action to grant advantage to Therin’s rolls. He could only do this for one roll during a stage, but it ended up being invaluable as they slowly gained ground. Khaless managed to keep up with them despite only a +1 to Animal Handling. Funny enough the original long-shot, the drunken, fast-talking halfling Gondolo, ended up being the most dangerous NPC racer, keeping pace with them for most of the race. While I had all these plans in place, it was impossible to tell how the race would end up working live. I was legitimately worried that my PCs would fall behind and never recover. Thankfully that didn’t happen. Both Khaless and Mannix/Therin were in the lead or close to it throughout the race, yet most racers stayed close enough to make it exciting, including Mannix throwing out caltrops to slow down some pursuers when they surged slightly ahead in the final stretch. The race was a lot of fun. The Mannix/Therin combo ended up coming in first, with Khaless hot on their heels. The payout was ridiculous, including several hundred gold in winnings to multiple PCs. At this point they could probably retire from adventuring at the ripe old status of level 2! But, the death curse won’t solve itself. After the race the players were invited to Wakanga’s villa to meet with the Merchant Prince. He had taken an interest and liking to our PCs’ various shenanigans around the city (and Fort Beluarian). Wakanga revealed some details about a previous adventuring party, The Company of the Yellow Banner. It was they who stumbled upon a lost city and saw visions of Acererak. It was the thin lead that suggested it may have something to do with the death curse (and further confirmed by Zitembe’s ritual on seeking the Soulmonger). The PCs were given one half of a Sending Stone that Wakanga had used to communicate with them. 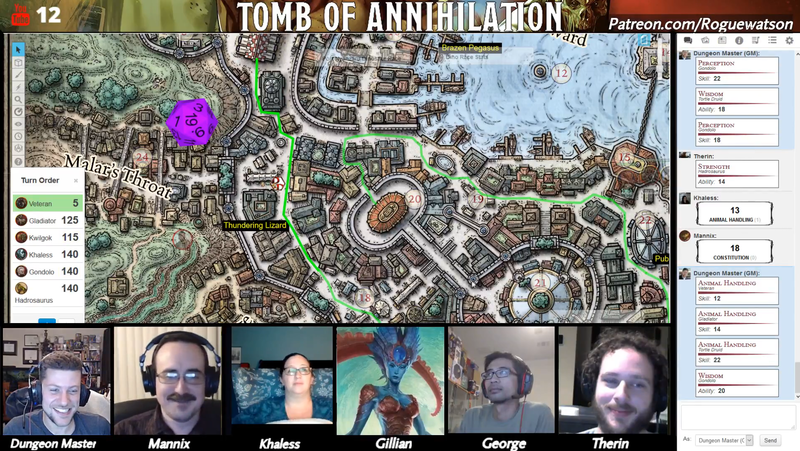 The messages had stopped when they had reached this city, but the PCs will be able to recall messages once per day by rolling an Arcana check to attempt to piece together their journey. Wakanga also told them of a construct that had once belonged to a group of elder tortle adventurers. The Merchant Prince had come into possession of a tattered, mostly destroyed journal. The only useful piece of information was notes about the construct and its location. Wakanga expressed interest in retrieving it – and its control amulet if possible, for a handsome reward. Finally, Wakanga revealed a teleportation circle, a gift from the Harpers. It didn’t work outside of Chult, but he was sure there were other circles out there in the jungle. He was willing to become the PCs’ official sponsor and allow them use of any circles for a much easier way to return to the city, provided they can find them. Armed with mountains of gold and more quests than they know what to do with, the party is prepared to get some final shopping done, then head out into the jungles of Chult. Next time – leveling up to 3 and beginning the jungle excursion!